Pahrump Valley Fire and Rescue Services crews were met with a variety of service calls over the past week. 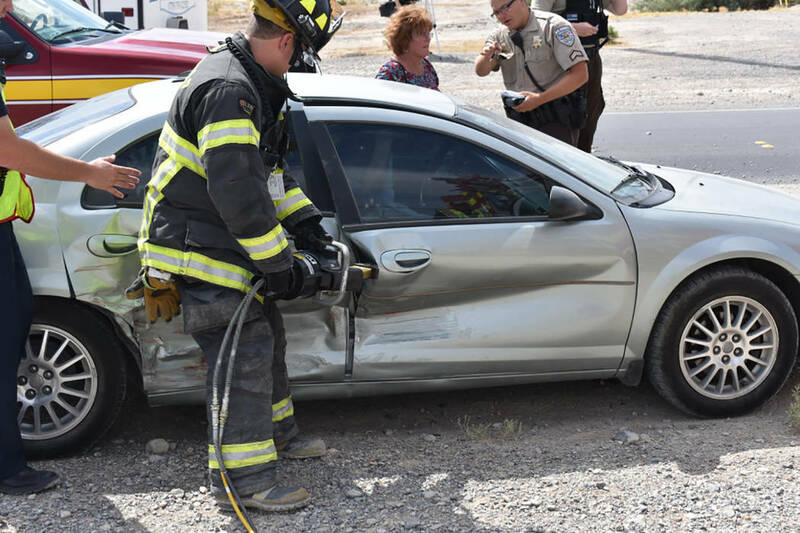 Special to the Pahrump Valley Times At least three patients were transported to Desert View Hospital after a multi-vehicle collision along Highway 160 and Blosser Ranch Road on Thursday, Sept. 7. One patient who was briefly entrapped inside a vehicle, was freed by bystanders, prior to the arrival by first responders. 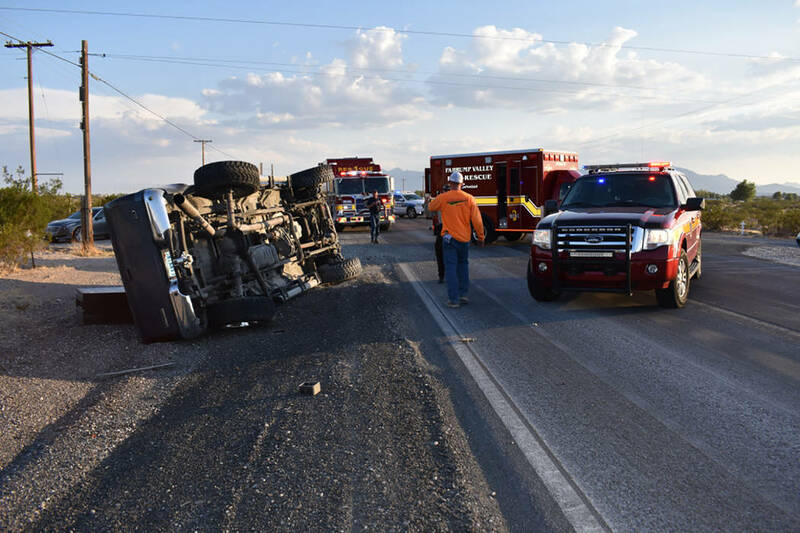 Special to the Pahrump Valley Times A Pahrump Valley Fire and Rescue crew member works to free the mechanically entrapped driver, following a two-vehicle collision at Bell Vista Road and Leslie Street, just after 8 p.m. on Thursday, Sept. 7. The patient was eventually freed and transported to Desert View Hospital. 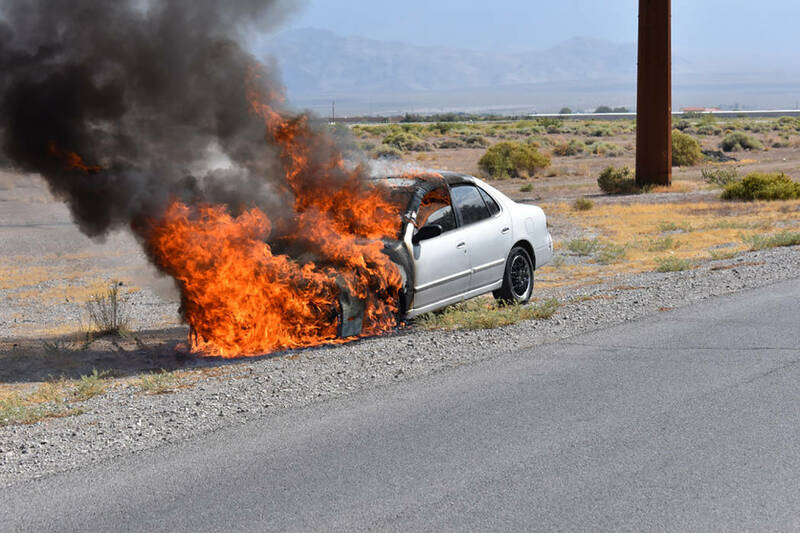 Special to the Pahrump Valley Times No injuries were reported following a vehicle fire at Thousandaire Boulevard and Homestead Road on Friday morning, Sept. 8. Fire crews were able to extinguish the blaze within minutes upon their arrival to the scene. Fire Chief Scott Lewis said crews were dispatched to Petrack Park on Tuesday, Sept. 5, for an unorthodox rescue assignment, just before noon. Later on Tuesday, fire crews were dispatched to a building fire on the 1400 block of East Highway 372, at 5:45 p.m. Roughly six minutes later, fire crews were summoned to the 2500 block of East Calvada Boulevard for a reported structural collapse. A motor-vehicle collision along North Nevada Highway 160 and Blosser Ranch Road prompted the response of emergency crews just after 6 p.m. on Thursday, Sept. 7. Roughly two hours later, fire crews responded to a multi-vehicle collision at 8:06 p.m.
On Friday, Sept. 8, fire crews were dispatched to a vehicle fire at the intersection of Thousandaire Boulevard and Homestead Road, just before 10 a.m.
Also on Friday, crews responded to the area of East Mesquite Avenue and Blagg Road for an injury motor vehicle collision just before 11 a.m.